Ever wonder how an SEO professional can charge first world rates to do third rate, third world work and still get a top rating from a heavily advertised SEO rating website? 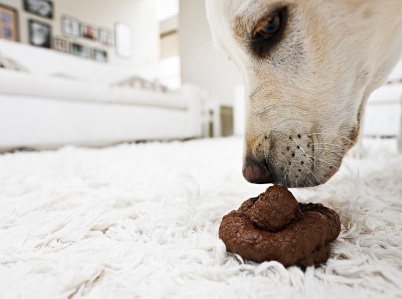 Edward Lewis has the lowdown on Top SEOs, including TopSEOs complaints. A big part of the problem with the affiliate business model is when people offer fake rankings / ratings and only promote whoever pays them the most. The person/company which can afford to pay the most for leads often can only afford to because there is hidden risk or hidden cost in the service, or because they don't deliver on their promises. An analogy here is those AAA rated mortgage backed securities where an S&P employee explained, "We rate every deal. It could be structured by cows and we would rate it." The biggest brands don't pay as much per lead because they don't have to. They invest in brand and quality of customer service. The best service-based companies don't need to pay cut-rate ad prices to advertise. The best SEO companies have far more demand for their time than time to pay to hunt for customers. 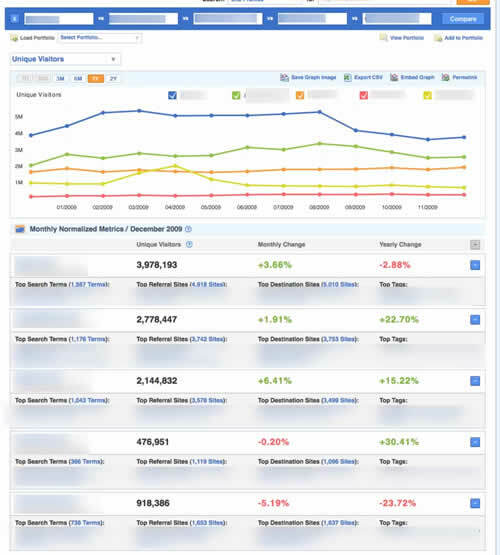 I remember back in 2006 when one of the currently "top rated SEOs" did work for my wife's website (before she met me). That SEO firm did nothing but outsource overseas irrelevant reciprocal link exchanges and her website *would not rank* for any semi-competitive keywords until *after* the reciprocal links page was removed from her site. 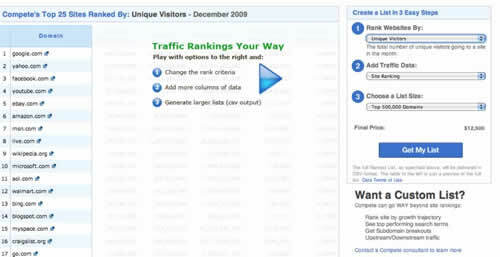 After we took down those reciprocal links and built some quality links the site started to rank. We changed the FTP details as well because that guy's services were not only not worth paying for...the reciprocal links were proved to be damaging, and we didn't want him to put them back up. And in spite of not doing any services for months (and certainly no services worth paying for), this person wanted to ensure they got paid for 12 months of "service." And they didn't want to let the contract end when it was supposed to either. They were all sales, all the time. It didn't matter that they were selling ineffective garbage. What eventually stopped the credit card charges was when I wrote him via email "If her credit card is charged again we will be doing a reverse charge and a full writeup on the service." I would watch your comments and threats my friend as you have no idea of what I am capable of or who I am - this is a small industry and if you are trying to be a an up an coming player in it this is not the way to do it by bashing your competition. A simple email professionally stating that you were unhappy with the service would have sufficed and I would have looked into to make sure Giovanna got what she paid for. I have run 2 optimization companies and have been in this business for 12 years now. With my contacts at Google and the other main engines I can get your ebook website banned within 1-2 days if this is how you do business - with threats and slander - keep it up. The funny thing is all I said was that if he tried charging again (past the contract) that we would reverse charges. And yet the sleazeball told me to "watch your comments and threats" and that he could use "contacts at Google and other main engines" to get my website banned. I have always had contempt for blowhards, and for pure hard-sales salesmen who put sales first and are willfully ignorant of their trade and/or who are willing to sell garbage product without any concern for the customer's welfare. I let it go for over 3 years, but if they are still scamming people then that needs to stop. I figure its only right that I write this post as a fair warning. All good things must come to an end. And so should bad things. Hopefully these clowns quite scamming people. Enough is enough. Update: 3 years later the fake ratings continue. BigMouthMedia was rated a top SEO agency by Top SEOs, even when it no longer existed as a distinct company after a merger years earlier. Top SEOs is so bogus with their ratings that they even put out a press release announcing the above rating of the above non-company! We recently reviewed a bunch of competitive research tools, and in that spirit I thought it would be a good idea to review Alexa. It is not that Alexa is the #1 service available, but they do provide one of the better services while being free. Every few years it seems they fall behind and become a bit of a relic, and then every few years they catch up. Recently when using Alexa I saw they added a good number of features, so I thought it would be worth doing a run down. 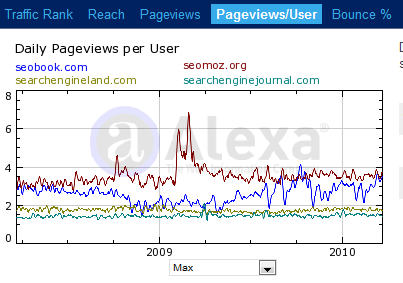 What Alexa is most popular for - their traffic rank, is popular because it has been around for a long time and is well referenced. I don't consider it to be a high value tool in terms of accuracy though. I think all these traffic estimation tools have a big margin for error, and its easy to read too much into the base/core number. Having mentioned that, you can try to use traffic data from Alexa, Google Website Trends / DoubleClick Ad Planner, Compete.com, and Quantcast to try to see how well they agree in terms of the traffic volume of a site or the relative volume between multiple sites in the same vertical. In spite of my lack of faith in the Alexa rank numbers some people do put weight on it. Some investors use it. 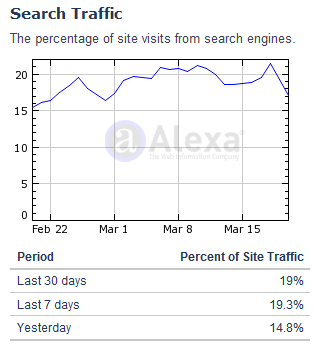 And when Markus Friend was launching PlentyOfFish he redirected Alexa users away from his site to stay below radar until his site was strong. 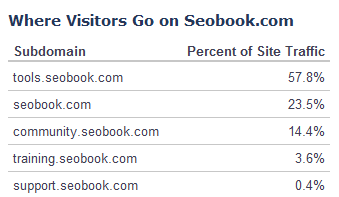 This is a good hint at how compelling people find a particular website. Sites which are driven by arbitrage efforts typically are not very engaging, hoping to either sell something right away or get people off the site. They also offer a time on site feature which you can use to compare how sticky sites are. This is basically a flip of the above...people who see 1 page and then are gone. You can see in the yellow area where we tested using a pop up. While the pop up did get more people to register on our site, we dropped the pop up because it was somewhat inconsistent with the rest of our marketing (our core audience of customers tends to tilt torward the expert end) and the types of people who were receptive to pop ups were not as good of a longterm fit for our site as customers. Who are they sending traffic to? Where do their visitors go after leaving the site? Who is sending them traffic? In many ways this can be unsurprising, but certain sites end up being more or less dependent on social media due to certain things like if they appeal to younger or older customers, what they are doing offline, if they are producing linkbait relevant to a specific audience which is heavily integrated into social media. This can also help you locate some advertising locations, figure out how reliant they are on search, and help you see which sites in the vertical they are closely aligned with. 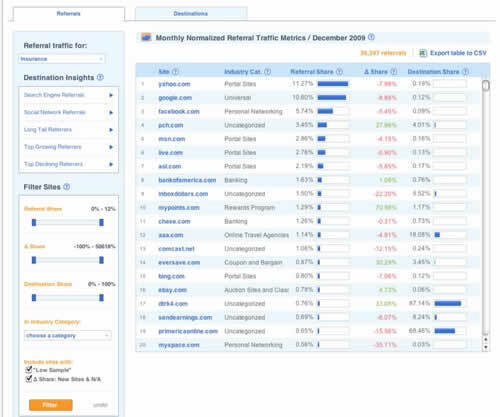 DoubleClick Ad Planner also has a pretty awesome traffic affinity feature. 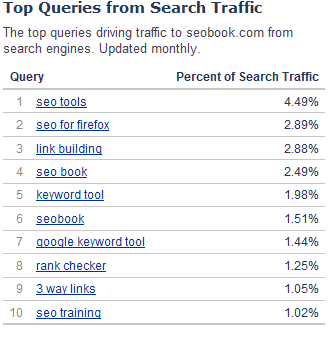 This shows the percentage of their traffic which comes from search engines. If it is abnormally high, that might mean the site has a search-heavy focus and needs some thickening out in terms of community participation and developing other traffic streams. If it is abnormally low, and you have similar link profiles to other sites that are higher, then it might mean that you are missing some important keywords that you should target. 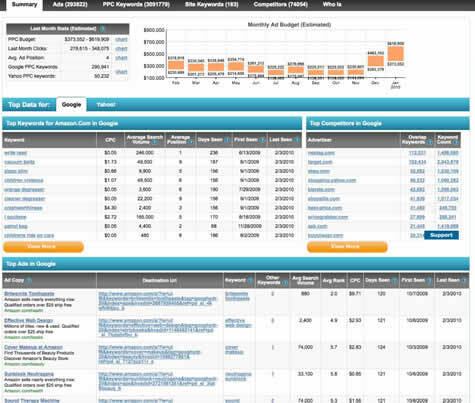 This is where digging in for more data with a tool like SEM Rush or Compete.com shines. Do they have a membership area to their site? 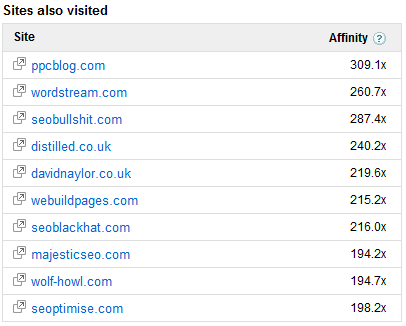 If they host it on a subdomain you can see how active they are. Having anywhere near 5% or 10% of your traffic in the private member's area is quite good if you have a well connected high traffic website. You can also see that our tools subdomain is a quite popular section of our site. 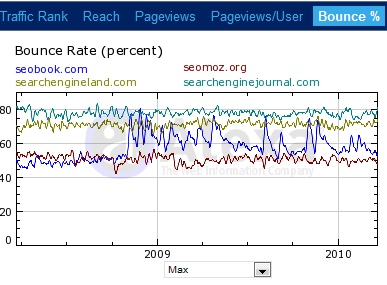 You can use this to find some of the most important keywords for a competing site. If some of your best keywords are being revealed it might make sense to publish some filler content on a popular topic that is hard to monetize so that it better shields some of your best keywords from free public viewing. If you install the Alexa toolbar they will also show you a bit more query data and list some opportunities for that site on the paid search front. 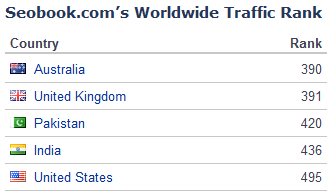 You can see what countries a particular site is popular in. 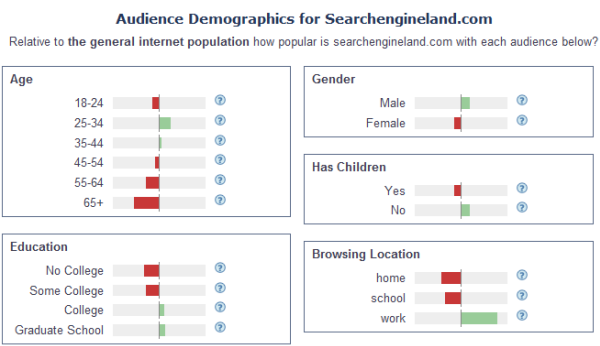 And you can get more detailed demographic data on a per site basis. 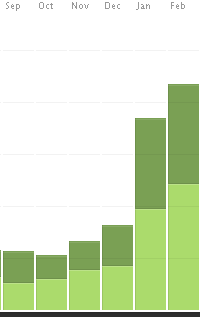 They skew a bit younger (I think sometimes my cynical nature turns off some young pople), a bit more college educated (they go to like 10x as many SEO conferences as I do), and we are perhaps a bit more popular with self employed people. 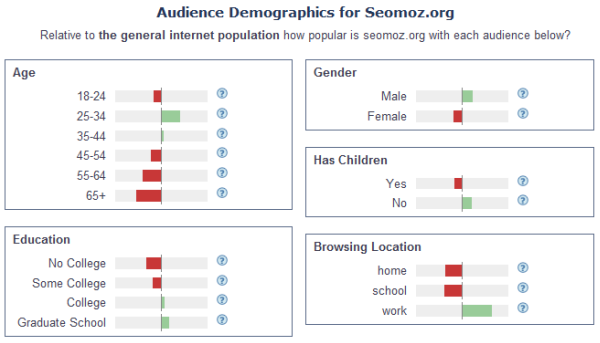 And then for Search Engine Land you can see that they have a similar profile to SEO Moz, but with even more people at work and more college educated people. And then you have sites which are extreme demographic outliers. Ever wonder who the customers are for those websites primarily marketed through hyped up email launch sequences by affiliates? Well throw some of those sites into Alexa, and you will find that for many of those sites it appears the target market is: old desperate and gullible men from the US who failed at life, still don't have a good b/s meter, and want to believe there is a silver bullet they can use now to automatically generate wealth. They can't, of course, but there is a crew that will sell them that story and get rich by working over the remaining crumbs in their retirement accounts. I am betting that part of why our age distribution is a bit more flat than most other SEO sites is because we offer free tools which are recommended to some of the audiences that buy the launch product stuff (or, that is my theory, based on some of them left their member's areas not password protected and sent a bunch of traffic at our site). 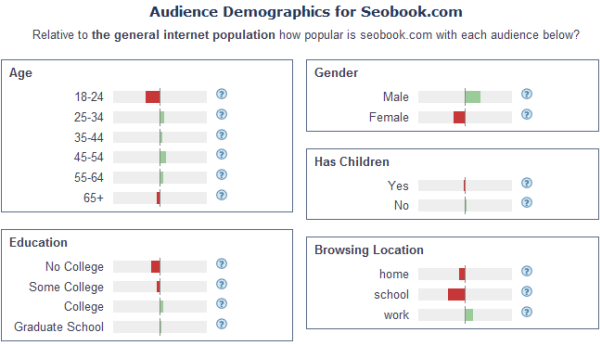 How do your demographic profiles compare to other sites in your space? Have you checked out all the features Alexa has added? What do you think of them? A couple other interviews I recently did, in case you haven't seen them: AdvanceMe & Ralph Wilson. According to Hitwise, Facebook just became more popular than Google Search. Not sure of HitWises methodology - why aren't they comparing all Google's web functions, including Maps and Mail? - but good on Facebook! For a site that didn't exist in 2003, that is quite some achievement. What does this mean for the future of search marketing? 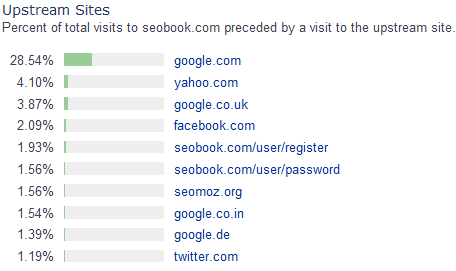 Given the lock-in for return visits, it's unsurprising that Facebook might receive more visits than a search engine. However, the most important aspect of different channels, as far as a web marketer is concerned, is: does the traffic convert to cash at some point? Social Media Marketing, like SEO, is a tatic. However, if the tactic don't translate into more business, then it's a waste of time. Whatever channel you use, it is important to establish KPIs - key performance indicators - that measure the effectiveness of your tactics, and directly relate to the success of you business. For example, one of the KPIs often mentioned in SMM is volume metrics, such as number of followers, subscribers etc. If we were to relate this metric back to our business objectives, we'd ask how does having a higher number of followers, or people claiming to be followers, result in more business? How many of those followers are really engaging with you? Or are they, literally, just making up the numbers? I've seen social media companies fudge this aspect. Some play around with the term ROI, changing the "I" from "investment" to "influence", or to "interest", and use the number of followers as evidence of the level of interest in a clients services or brand. The bottom line is the golden KPI. It can become blurred in bigger organizations, but for the little guy, it is crucial. Search marketers know that the volume game can be an illusion when it comes to making money. "Jokes" may be a very popular keyword term, but it's not making people any money because there is no commercial intent. "Second mortgages" is not a particularly popular term in terms of volume, but is lucrative as it has clear commercial intent. A high position for second mortgages in search rankings will make you money. Conversely, how difficult would it be to get buzz around the term "second mortgages" via social media? Sure, with some inventive twisting and disguising of the true message it could be done, but really, it's pushing water uphill. The social environment isn't really suited to such a message. The two channels are like apples and oranges. Different environments work for different messages. Social media is great for generating awareness, getting people talking, and when integrated with an SEO strategy can be a great way of getting links. Primarily, it's a brand strategy. However, because it is a social environment, there is less tolerance of overt commercial activity that in direct channels. Business outcomes - can you link the campaign to specific interactions, such as sales? Influencer Reach - how many influencers picked up on your message and spread it? Engagement - how many of those people who saw you message contacted you, or took a desired action? Conversely, SEO isn't much use for building brand awareness or encouraging people to talk about your message. The environment is similar to direct marketing. It is well suited to direct response and commercial activity, as the intent of the user can be determined, and if that intent is commercial, then people welcome commercial messages. Business on the web typically falls into one of nine groups. Which is yours? Decide which business you are in. When deciding on marketing and advertising tactics, ask yourself which environment is best suited to developing your business, then develop KPIs that support that business. You key KPI should be the bottom line - either this activity returns more money than you spend, or it doesn't. 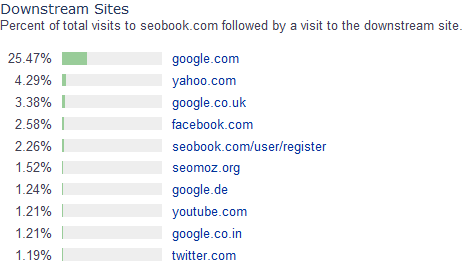 They index the top ten results in Google, Yahoo, and Bing (although I only saw G and Y). The one really neat thing they offer is overlapping keywords between Yahoo and Google for a particular domain. I'm not aware of another spy tool that does that. Their database does not seem to be very deep but they are newer so that's to be expected. 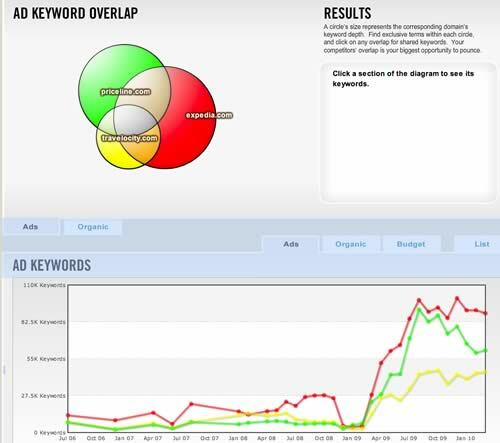 The do show overlapping keywords, total keyword count, and a monthly budget under their competition tab. 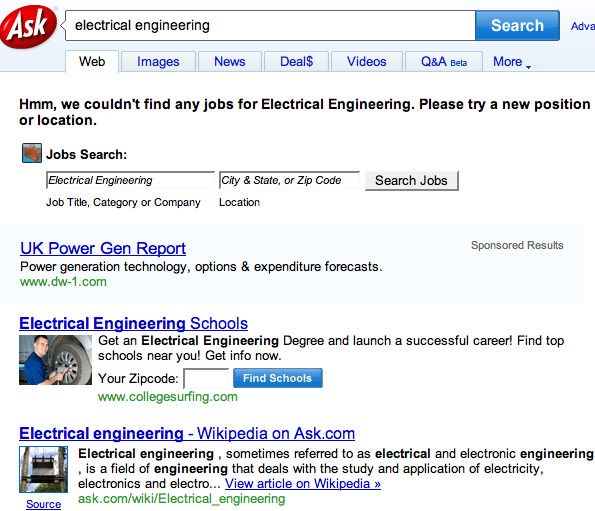 Here is another spot where they compare Google and Yahoo, this time for overlapping keywords between sites. The impression share is not something I've noticed in most other tools and the other 4 metrics can be useful in determining which competitor might be a bit savior in the PPC game. 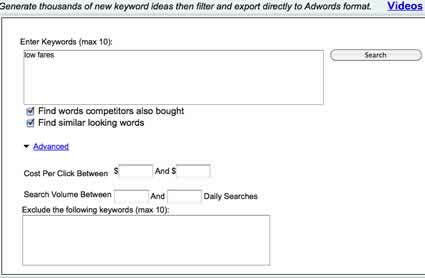 Other metrics they will show you on the keyword level include whether or not the keyword has direct ranking affiliates, the average CPC/search volume, and total advertiser counts in Google, Yahoo, and Bing. 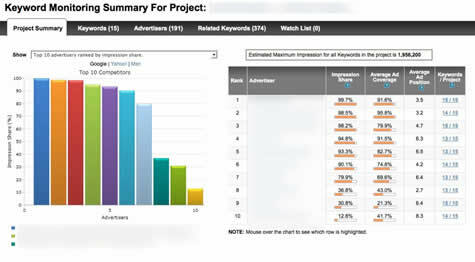 The tool also shows you related keywords you may wish to add to your campaign or just place on your watch list. 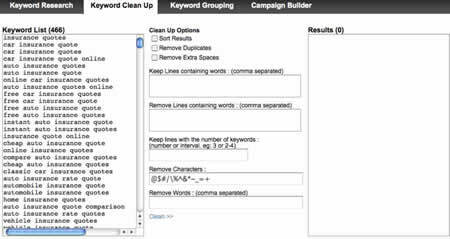 This is where you can weed out keywords that contain certain words, are duplicates, or have special characters. You can also choose to remove extra spaces if needed. Here you can input bid prices for Broad/Phrase/Exact match bids, set up your ads, and input the url. 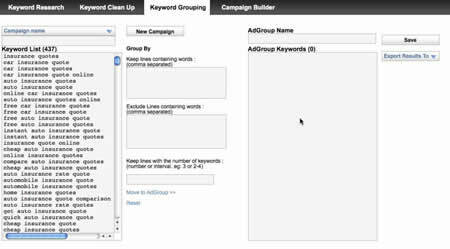 Then you can export for use in Google, Yahoo, or Bing PPC campaigns. This promo discount voucher will expire on 12/25/2010. iSpionage has some promise and seems to be much more into the PPC market than the SEO market. If that's the case then they are taking on some pretty big players as many of the spy tools offer both PPC and SEO data sets. They have some unique features and it will be interesting to see how they develop their product going forward. Keyword Spy offers 3 different accounts. No other competitor really comes close to the breadth of their country offerings. 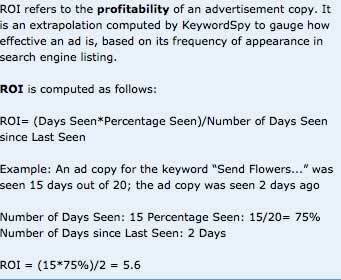 PPC Ads (ad copy, the keyword, estimated search volume, estimated CPC, the position last seen of an ad and it's average position, total days seen/days checked. You can also see the ad url and destination url of the ad in addition to other keywords being bid on for that particular ad, as well as an estimated ROI. Competitors in PPC and Organic results. The research portion does *not* include organic or PPC overlap coverage, which kind of stinks especially when you consider the price point they charge. 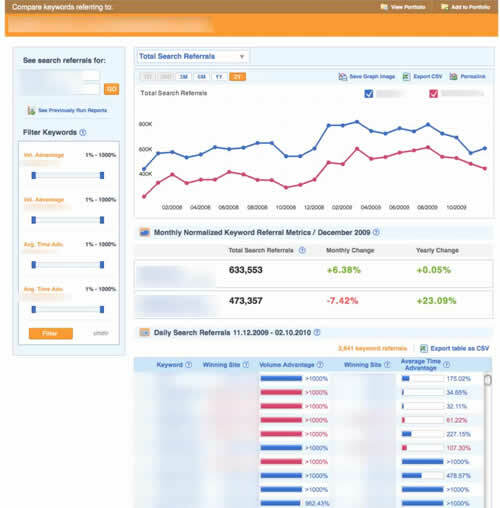 You get access to their Top 1000 sites and keyword reports which can be previewed here. You can filter with these metrics but you can only apply 1 filter to the results at a time. Which can be bothersome if you are doing large scale research as they limit the exported data to 50,000 keywords. ROI- they compute this as (Days Seen*Percentage Seen/Number of Days Seen since Last Seen). Below is a screen shot of their formula. Again, this is based on the assumption that the PPC advertiser is shrewd and on top of things. I don't particularly care for this metric. ROI to person A can be much different than ROI to person B for a variety of reasons. First/Last Seen- Last seen is the last day KS saw the ad (they scan daily) and First Seen shows the first day KS saw the ad (I believe its back to August of 09 as of this writing). Profitable Ads - Ads that are profitable based on their internal metrics (like ROI and such) out of total number of ads. 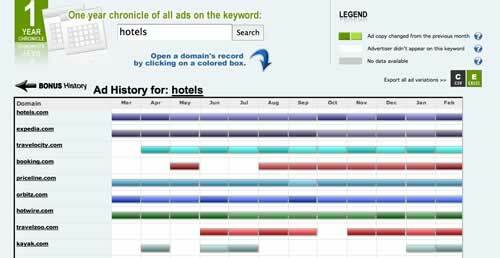 Affiliate Ads - Ads that are affiliate ads (based on destination url) out of total ads found. 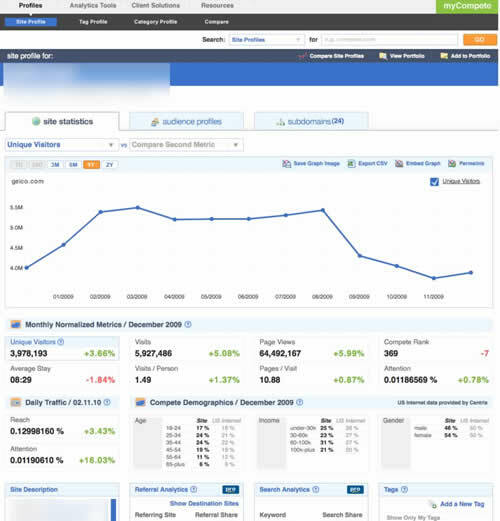 The Tracking account option gives you real time tracking in Google, Yahoo, and Bing for your PPC and Organic campaigns. This can be useful in checking out your coverage and competition across all three engines. You can also benchmark your data with the competition's scraped data. 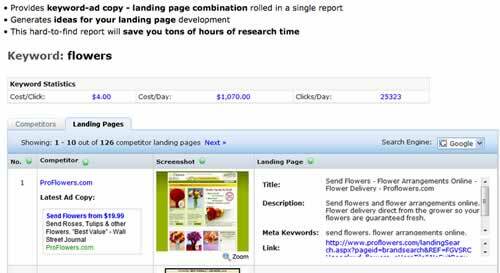 Landing Page Intelligence - shows current landing page, ad copy, and destination URL for a particular landing page. Organic and PPC overlap data (only between 2 sites) and quite frankly, this is much more research than tracking and should really be included in the research account IMO. So the tracking account is really more for tracking your campaigns across the 3 big PPC engines with some nifty benchmarking and gap analysis features but I don't see it as being overly useful for smaller PPC advertisers, although the coverage options might be a good fit for those in competitive markets across Google, Yahoo, and Bing. In general, Spy Tools aren't all that great at looking into smaller sites and markets simply because the resources required to be accurate with somewhat sparse data would be overkill and far to costly. This is why I do not really feel the tracking option is going to be a good fit outside of pretty big PPC advertisers. 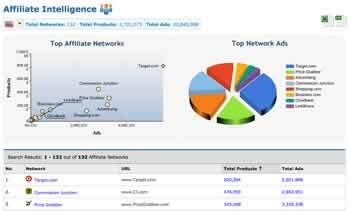 This tool gives you access to look at products and ads being used by 132 affiliate networks. 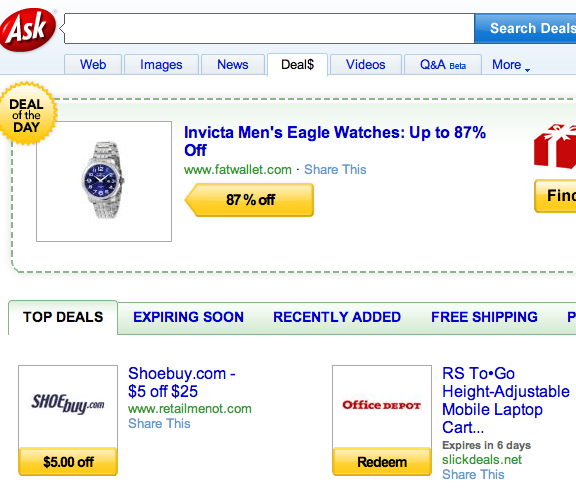 You can click through on any network and be shown their offers by URL with searchable affiliate ads for those products. 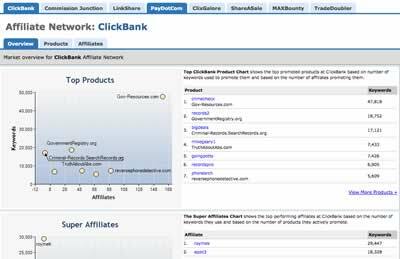 Affiliate Reports gives you access to big players in the affiliate marketing space such as CJ, LinkShare, Clickbank, ShareAsale, etc. Here you can access top affiliate products and top affiliates by product id and affiliate id respectively. You can also use affiliate product and affiliates id's to search in the destination URL field to try and find additional products/ads they may be promoting. Keyword Spy mentions something about "Anti-cloaking" technology but they do not elaborate on it. 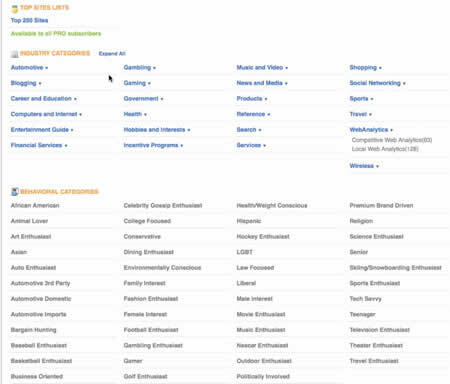 However, color me skeptical that these affiliate options are able to uncover properly cloaked links by top affiliates. So while this may be good for help in looking at potential affiliate products, as well as finding affiliates who do not cloak their links, I'm really not overly impressed with these features but they can be somewhat useful when first starting out. Keyword Spy is a feature rich membership and they have a deep database. 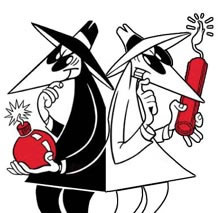 For me, if I had to pick just one tool I would opt for either SemRush or SpyFu as both supply solid PPC/SEO competitive intel at a much more reasonable price. Although, if I were a serious PPC player their tracking account might be quite nice (still have reservations about giving a spy tool company my campaign data though). 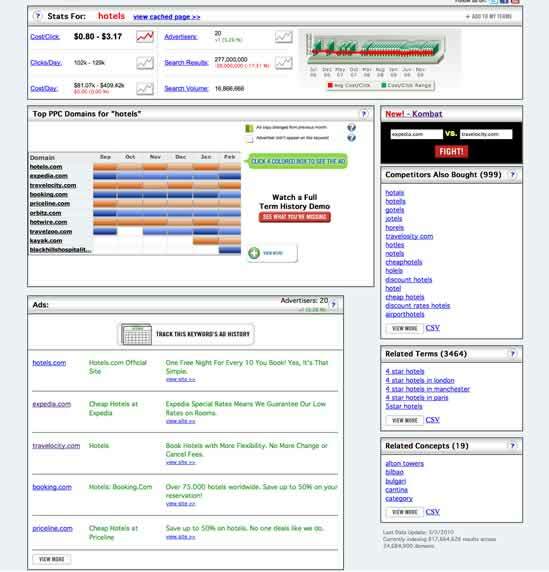 Another great feature for Keyword Spy is their regional databases...they cover many areas missed by some of the other competitive research tools. "go ___ yourself. we don't sell our user information." To which there was a response about how I am not very professional. And the thing is, how are you supposed to respond when people falsely accuse you of criminal conduct while using your services for free AND insulting you? Is there a professional way to respond? Does the person who gave you no benefit of the doubt, insulted you, and wasted your time somehow deserve the benefit of the doubt? If yes, why? They certainly didn't give you any. The way I look at business is that being short and sweet (or short and sour, in some cases) is probably one of the most professional things you can do. You only have so many hours to live and you only have so much time to service paying customers. The worst thing you could do is give someone like that the benefit of the doubt after they walked all over you, because then they might become a customer. And that type of person tends to be abusive, lazy, rude, selfish, and ignorant. Not a good customer. If you don't enjoy what you do then its best to stop doing it. Part of ensuring work is enjoyable is filtering out those who do not fit. So if a person says "___ off" at hello, then, if you are concerned with professionalism, reciprocating is the best thing you can possibly do. Any other course of action simply wastes time that could be spent servicing real customers - which certainly isn't very professional. Like in any consulting field, SEO is rife with competition. There is only one way to win in such an environment, and that is to set yourself apart from the crowd. Here are some ideas on how to construct winning proposals. Large proposals take a long time to do. On the upside, large proposals can look impressive, simply by virtue of their size. Clients often like to see large proposals, but they don't tend to read them. Proposals can be a tricky balance to get right. No matter how brilliant your solution, most clients will think twice about you if you present it on a single sheet, especially if they have no prior connection with you, or aren't meeting you face-to-face. A proposal of a certain size can appear more authoritative. One good way of presenting a proposal is to break it into three parts. The first part is a summary, including your client-specific solution and costs. Length can vary of course, but keep it succinct. No fat. The second part is a case study or two. Again, keep them succinct. It's highly likely that the client won't actually read beyond this point. Finally, add background information about you, your company, your history and the SEO business, all of which should be aimed at supporting the summary page and case studies. This final part can be generic and doesn't need to be re-written for each client. Clients may only flip through this section, but tend to find it reassuring that it exists. Contrast this approach with a proposal that is threadbare. It may be irrational, but thin proposals can feel incomplete. In your summary pages, share real information. Share the type of information that is valuable and the sort of you'd usually charge for providing. Clients are likely to assume that if the SEO is giving a few morsels of valuable information away in the proposal, then even more valuable information will be forthcoming if they sign you. Demonstrate your mastery. If all you do is provide generic information at this point, then your proposal is less likely to stand out. Some potential clients, of course, may pick your brain and then implement your solutions themselves. Whilst this can happen, it's unlikely. The client already knows they want SEO by the time they're at the proposal stage, and if they could have done this work themselves, they probably would have done so already. Secondly, you can outline solutions that involve time cost to achieve. Imply that this work must be undertaken by someone who knows what they are doing. Outline the risks of not doing this work properly. The more real work, and risk, there is invlolved in implementation, the less likely a client will be willing to go the do-it-yourself route. As we all know, there is a lot of real work involved in SEO. Make sure the client is left in no doubt on that aspect. Focus on the clients needs. Nothing loses a potential client faster than an SEO who talks entirely about themselves and their industry. Clients don't care. Clients care about their problems and their industry. In the summary pages, restate the clients problem and propose your specific solutions. Outline time frame and costs. This exercise is useful for a number of reasons, the main one being that you, or the client, may not know what the actual problem is! What a client says may not be what they mean. For example, the client may say they want SEO because they're heard that's a great way to get traffic quickly. They may not say it in these words, of course. They may say they want SEO, and they want it asap. However, if the SEO has asked enough questions, aimed at identifying the problem, the SEO may unearth unstated problems. In this case, a client wants to increase traffic quickly. A solution to such a problem might be a combination of SEO and PCC. 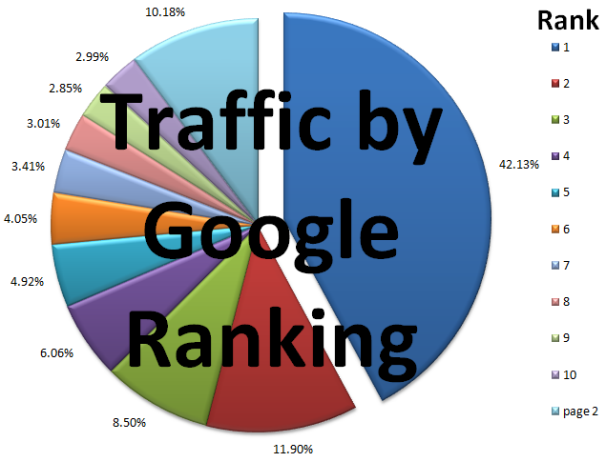 The PPC delivers immediate traffic while the SEO strategy might take some time. Formulate questions aimed at identifying the clients actual, as opposed to stated, problem. They may be quite different. The result is that your solution will be a good fit, which will lead to less frustration, on both sides, further down the line. You also might discover at this point that the clients expectations are ridiculous, and you'd be better off looking for a more reasonable client. For example, I was once pitching to a large advertising company. Their clients had been asking for SEO, so all they knew is they "needed some SEO". Problem was, as I discovered in the meeting, was that they knew nothing about the need to alter sites or web publishing approach. They had told clients they could deliver SEO as a bolt-on-service, a wave of the magic wand that miraculously delivered rankings and free traffic for life to brochure sites. I didn't go any further with them. Guarantees are a contentious issue in SEO circles. Many SEOs - quite rightly - point out that no one can guarantee a ranking position, which is true, but such technical nuances may unsettle a client. Clients tend to like assurance, and a guarantee can help provide this. So rather than dismissing guarantees, look at aspects you can guarantee. A fiend of mine, in a different industry, offers a guarantee that goes along the lines of "if you don't feel satisfied after our strategy meetings with you, even after you sign the contract, you can walk away, no questions asked, and no charge.". That sounds like something substantial, but actually he is just restating consumer law in the country where he lives. The law is that a service must be fit for the purpose the client intended, and if it isn't, the client has a case against the provider for non-suitability of service. My friend realized he could never afford to contest such cases, and would likely lose, as the consumer law favored the buyer. All an aggrieved client really had to do to win such a case was say the service wasn't fit for their purposes. He was dealing with firms with deep pockets, and legal action defending against such firms would come at high cost, even if he was in the right, so he decided to restate a consumer right the client actually already had, combined with an economic reality - his inability to engage in costly legal battles - into a form of a reassuring guarantee for sales purposes. There is no sales tool quite so powerful as a good case study. A case study is a story. People love stories. A case study is also proof of your ability. Outline the problem. Tell your audience what the problem looked like before you started - very useful if this problem is similar to the problem the prospective client also faces - what you did to solve the problem, and the positive results of your solution. Stories are very powerful sales tools, and a case study is a great opportunity to tell a few. Consider printing and binding your proposal, and delivering it. We receive so many emails these days that they don't make us feel very special. It doesn't feel like there is much effort gone into them. A binded proposal, on the other hand, feels substantial. In the interests of speed, you can still send an email copy, but try doing both and seeing if you land more deals. I remember in 2nd grade when our teacher was teaching us how to do math I raced ahead and was doing lessons for today, tomorrow, and next week. The teacher rewarded my efforts by yelling at me and ripping up the pages from the book and giving me a 0 on that homework. In fourth grade we would play around the world with math flash cards where you raced to say the answers, and I would literally go all the way around the classroom without losing. I won so much that the other kids would boo when I won and cheer if I lost. In 5th grade I scored well on some state examination test that they had me take a college level entry exam. I beat most college-bound high school students in math before I entered junior high school. Between 7th and 8th grade we moved. Somehow in 8th grade they put me in slow learners math. Maybe they were trying to balance the number of students in each class? While in slow learners math the teacher handed out these obscure word problem tests a few times a month. Every time we did them I would either tie with the winner or beat all the kids who were taking algebra. There were other topics where I sucked. Anything to do with spelling fail. Writing? Not so good. Foreign language? No conozco! Typing - absolutely brutal. All these years later I use the math and logic to make money writing words, and matching words up in patterns that algorithms like. But what more would I have done if I didn't waste 6 years of my life in the military? Maybe I wouldn't have fell into marketing, but it is almost impossible to do anything online and willfully remain ignorant to marketing. If you have any level of curiosity you will stumble into it (especially if you have any ambition and lack capital). 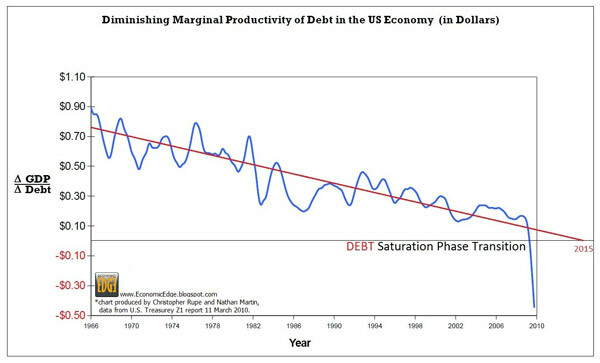 But education is to set up to beat the creativity out of you, punish outliers, and turn you into a debt slave consuming drone. You should respect authority, even if ill gained. If students were any good at applying math & critical thinking to the real world there would be riots in the street. Online critical thinking isn't typically appreciated either. Social media makes one-liners great, so plan on including a few of them, and plan on some of your words being taken out of context and used against you. Any form of criticism is defined as being linkbait or an attempt at capturing attention. As the web continues to saturate and it becomes more like the real world it will only get more absurd. Is it any wonder why so many who are struggling with kids, jobs, rising medical costs, etcetera have such a tough time wading through all the crap? There is only so much attention to go around. Anything you don't know = grab the ugliest segment of the market + embellish it & state that is what the entire market is. Easy. Anyone who is an SEO is a spammer who illegally hacks websites trying to sell overseas pharmacy drugs and rank for misspellings of birtney spaers. All domainers are cybersquatters & brand hijackers. Affiliates only push scams that use reverse billing fraud.